In a dinner rut? Try a ‘Build You Own Dinner’ night! Creating dinner can be a fun way to bring the family together and alleviate arguments and complaining about what is being offered. After all if you don’t like it… you made it! 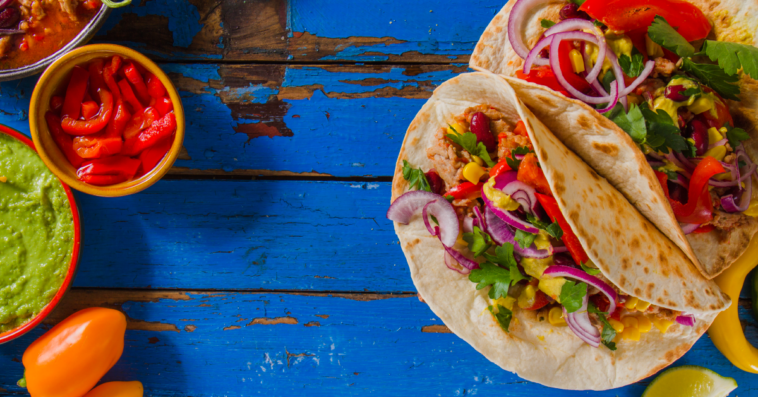 Get creative & have fun with dinner tonight. 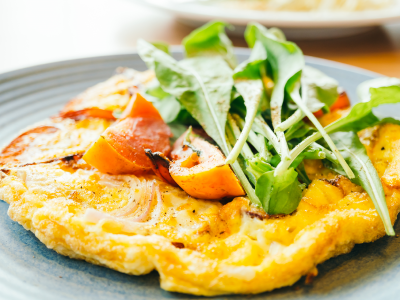 Omelettes are an easy, quick & healthy meal option. Prep the egg mixture according to your favourite recipe. Have each person choose 2-3 fillings and help them make their own omelette. This same idea can work well for a frittata or quiche as well. Arrange all the toppings in the middle of the table and let everyone create their own masterpieces! Tonight is fiesta night! 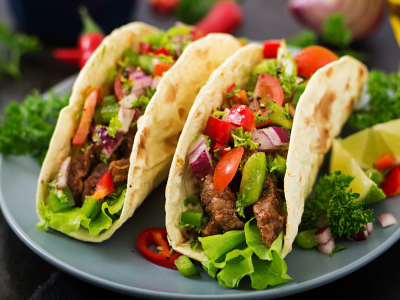 Some ideas: Ground meat with taco seasoning, lentils in taco seasoning, black beans, feta, grated cheese, avocado, guacamole, salsa, sour cream, salsa verde, plain yogurt, pineapple, jalapenos, cilantro, lettuce tomatoes, hot sauce, olives. Set each offering on it’s own plate and arrange the plates on a table or counter just like a salad bar in a retro steak restaurant 🙂 Set some guidelines such as must choose something green & 3 other vegetables. Some ideas: lettuce, tomato, cooked egg, chopped meat, cubed or grated cheese, avocado, beans, hemp hearts, pumpkin seeds, dried fruit, cucumber, olives, feta, grated carrot, apple, grapes, blueberries, strawberries, chopped mint, chopped cilantro, corn, spinach, arugula. Pizza dough is easy to make must pre-made shell, pita, or even English muffins work well too. Prep small pre-made crusts on a baking sheet and preheat the oven. 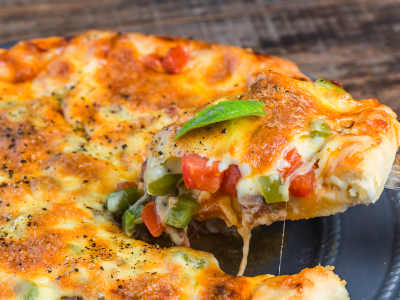 Have fun creating your pizza creation that is perfect for no one but you! You may never order in again! Some ideas: Tomato sauce, white sauce, grated mozza, feta , ham, pineapple, broccoli, cauliflower, prosciutto, garlic, pepperoni, spinach, mushrooms, arugula, garlic, olives, peppers, cherry tomatoes, basil, oregano. Sushi is surprisingly easy to make at home. Here is our favourite recipe. Now it’s time to get creative! Have each person pick their fillings and maybe even try rolling their own. So much fun! 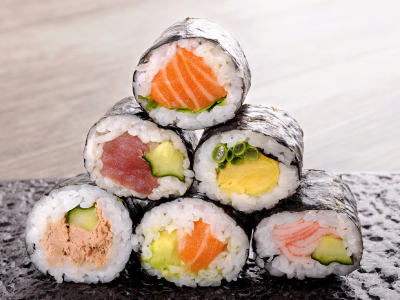 Some ideas: Sushi rice, nori, mango, avocado, beet, cucumber, imitation crab, radish, micro-greens, cooked shiitake, sesame seeds, tuna, mayo, asparagus, wasabi, soy sauce, pickled ginger, smoked salmon, julienned carrots, spinach, teriyaki sauce, cooked chicken, teriyaki sauce, sushi grade tuna or salmon. 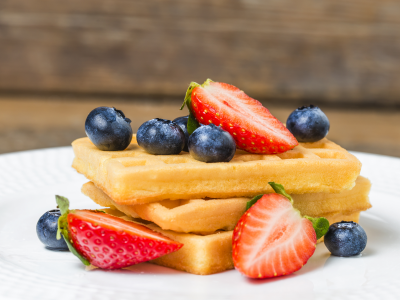 Waffles make an easy meal into a celebration! They can however take some time to cook so either use pre-made waffles or cook them in advance and warm them up in the toaster on the lowest settling. Then have everyone dive in and build the perfect stack! 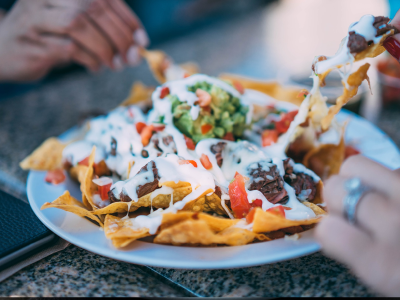 Nachos are a great meal idea when you want to settle in and chat as a family or when you want to have a casual date-night with your spouse or one of your kids. The key to easy serving & clean up of nachos is to use a parchment lined baking sheet. Then you can build the pile high with all sorts of toppings. Once cooked, just carefully pull the parchment paper (and nachos) over onto a wooden chopping board and place it in the middle of the table. 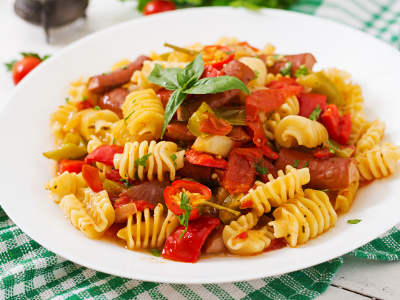 Have you ever been to a pasta bar? You get to choose all the ingredients so you can have just what you like! Pre-boil a couple of different noodle options and toss them in a small amount of olive oil so they don’t stick. Prep all the add-ons (cut into small pieces so they cook quickly) and arrange them on the counter. Have everyone start by choosing Their veg & protein, then the type of noodle, and finally their sauce. Everything is put into a small frying pan to cook on high heat and then served. You will need a few small frying pans to speed things up. Some ideas: Tomato sauce, pesto, olive oil, butter, parmesan cheese, sausage, chicken, broccoli, peas, asparagus lemon, alfredo sauce, spinach, arugula, shrimp, clams, mushrooms, garlic, onions. 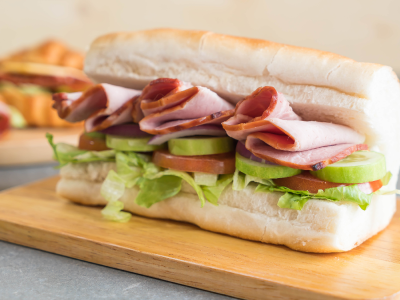 Channel your inner sandwich artist! Think of your local sub shop and set up all the options. It can also be fun to write all the options out on pieces of paper and have everyone place their orders. Have the kids make all the sandwiches while you relax! 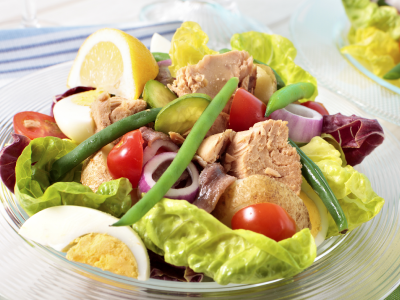 Looking for more healthy eating ideas? We have you covered with our Satisfying Summer salads!